If you’re looking to spice up your shoe collection or simply add a bit of personality to your business casual and day-to-day outfits, monk shoes might be the footwear you’ve been praying for. Both classic and unique, these are a great way to step up your shoe game and add a little kick to your wardrobe. Often considered the casual cross between a traditional oxford shoe and a derby shoe, monk strap shoes are smart, traditional leather footwear that contains between one and three straps which fasten across the arch of the foot. 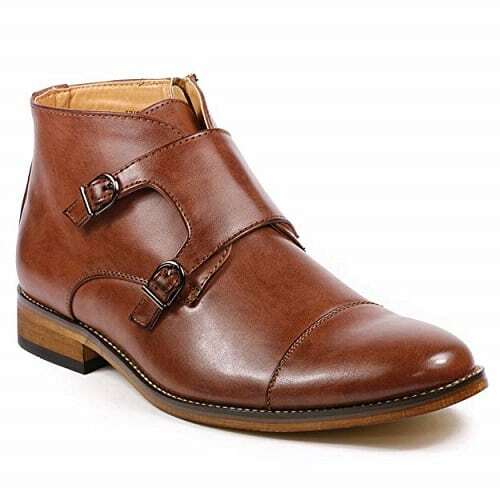 The shoe name would have you believe that they were born straight out of a friary, but the truth is that there’s some level of mystery and debate surrounding the origin of the first monk strap shoe design. The most commonly accepted story details that it was first conceived in the 15th century in Europe, where monks worked hard, tireless days tilling fields and executing other hard labor as an expression of dedication to their faith. Unfortunately, the monks of the 15th century weren’t exactly great recordkeepers when it comes to shoe history, but it’s said that a monk in the Alps invented the first monk strap shoe to protect his feet. Naturally, working in the fields and mountains required footwear for protection. The legend goes that monks sported double-strapped sandals at first, but found they didn’t provide the much-needed protection that tasks like tilling, plowing and heavy lifting call for. With the evolution of their needs and the development of their means to meet their work conditions, these monks eventually developed a closed-toed shoe with a strapping design. It had the same traditional monk-strap elements as their sandals, but with the added protection of more covering. As time passed and the early 1900s came, the shoe moved from work gear and evolved into a fashion item likened to the love child of a loafer and a classic Oxford shoe. Though its popularity did fade for a while, in recent years it has waltzed back into the spotlight as a smooth, debonair alternative to the traditional, stuffy dress shoe. As both classic and contemporary, the monk shoe has a design that makes the statement wherever you show up. While not necessarily a staple item in the realm of footwear, adding a pair or two of monk straps to your shoe collection can vastly diversify your looks and insert a little bit of personality into your dressing habits. 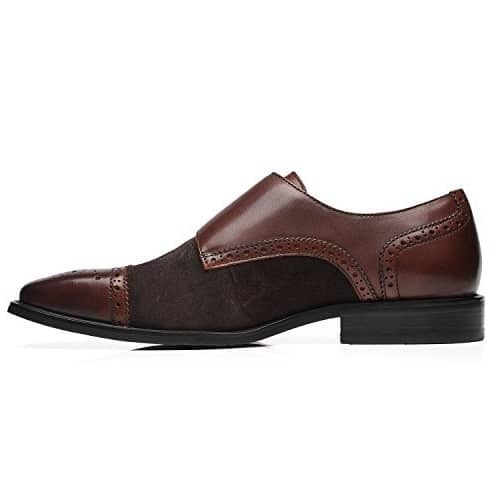 These days, monk strap shoes are commonly worn in a wide range of scenarios. From business casual to chic informal, these versatile shoes can be paired with an endless array of looks. Often worn with tweed, blazers, navy suits and just about any other business casual or smart ensemble, they can add an element of aloof style to a pair of navy dress pants or turn an otherwise bland blazer and jeans into a quirky, bold statement. The highlight of monk shoes is their unique style. As slightly unusual but not outlandish, they add spice and personality to any ensemble. Their straps set them apart from other men’s dress shoes, which adds an element of style that sticks out without rudely intruding. In short, a trendy pair of monk shoes is the perfect way to express a little bit of your personality through the way you dress, without getting too wild with the entire outfit. Because of their overall design, monk strap shoes generally have a narrower, snug fit. This isn’t to say necessarily that they’re always more comfortable or that they’ll feel like a pair of comfortable slippers for men, but they might fit more appropriately and provide a little bit more support than the traditional, drab dress shoe. More isn’t always better, or is it? Whether a monk-style shoe is “single” or “double” refers to how many buckles and straps are used to fasten the shoe. Both designs should stay on your foot perfectly fine – the real determiner is just a matter of style and overall preference. Though triple and even quadruple designs do exist, these are generally regarded as trend items that come in and out of fashion in record time and aren’t really worth the investment. They are, if you will, a sort of gimmick of the monk strap shoes. Double strap shoes are easily the most popular. In theory, they are more versatile. Their multi-strapped design supposedly allows them to fasten to the foot better, providing a more snug, tailored fit. However, in practice, they are about the same as their single-strap and triple-strap variants. If you decide to go with a double strap design, do so because of its style elements. These shoes are slightly louder, slightly bolder and arguably have a little more allure. For those who like to wear their personality, double monk straps are a great method of expression, though some may find them a bit too bold. Meanwhile, single strap monk shoes are the original model. They’re easier going, low-key option. Not for those looking to make a statement, single strap monk shoes fly under the radar, refraining from pushing the boundaries. Though they can be worn in much of the same situations as a double strap shoe and even with the same outfits, they are quieter, subtler, for those still exploring their fashion sense or those who prefer a sleek, modest look. 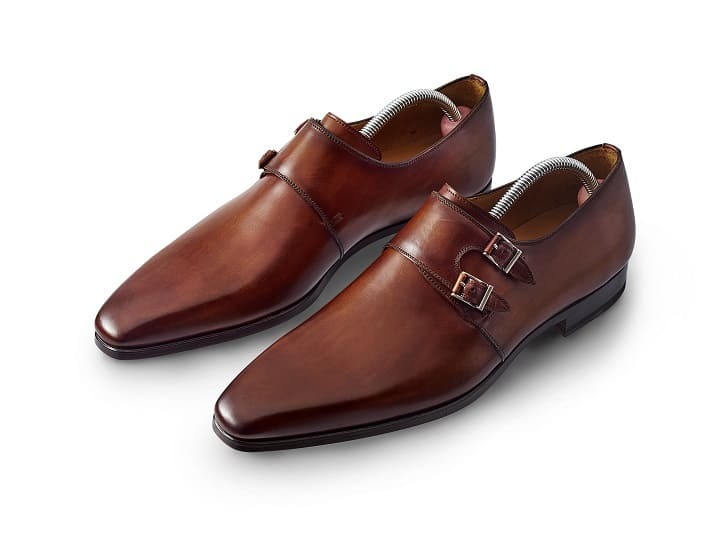 In the end, trends always ebb and flow between single and double monk strap shoes. Whether you want to purchase a single, double or even triple strap shoe might be a decision you want to sleep on (ideally in some heavenly comfortable men’s pajamas, just for good measure). Ultimately, your decision should be determined entirely by your own taste, as trends are always liable to change slightly anyway. Another distinguishing factor when it comes to monk shoes is whether they are ready-to-wear (sometimes abbreviated as RTW) or bespoke. Ready-to-wear monk strap shoes will have straps with pre-set holes, so they can be adjusted to fit feet of multiple widths and sizes. These are the shoes sold in stores. Meanwhile, bespoke monk shoes are customized footwear. Like any good pair of high-quality boxers, they hug and cup all the right spots. Because they are altered to fit your foot and just your foot, they will only contain one hole in the strap for the buckle to fasten to. In theory, they form perfectly to your foot for a customized look and feel. 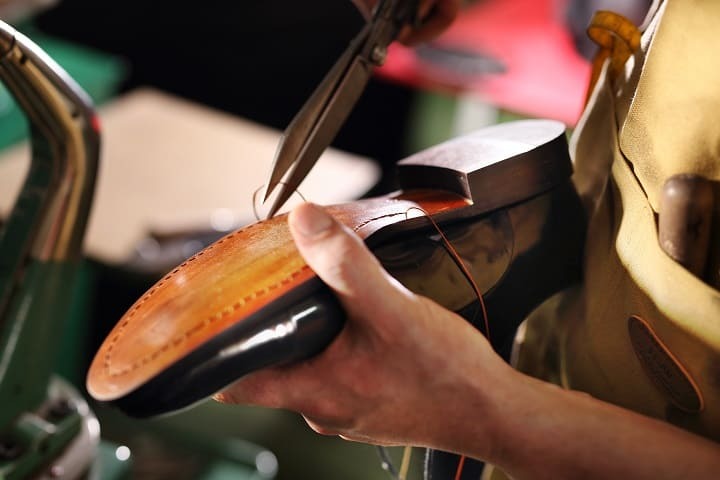 However, that luxury of the ideal sizing is one that doesn’t come cheap – bespoke shoes, because of their tailored needs, are always significantly more expensive than their ready-to-wear alternatives. 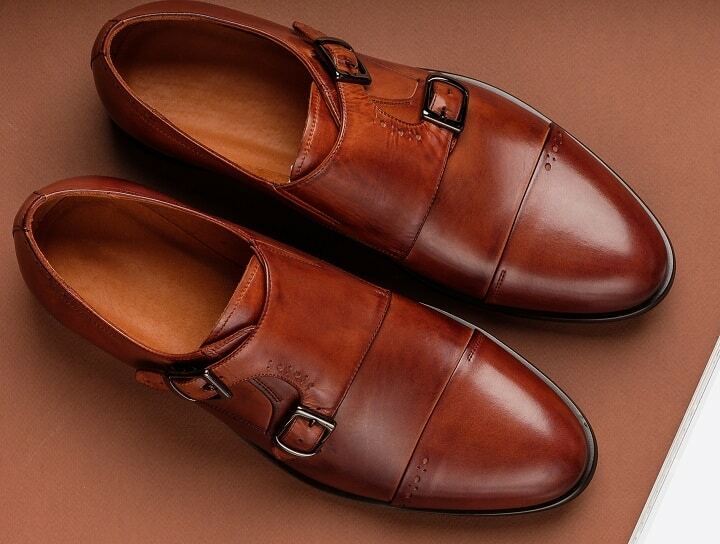 Much like an Oxford shoe, classic monk strap shoes have a plain toe and no intricate detailing. With a minimalist approach, they are usually straightforward and simple in design, with few embellishments of decorations. 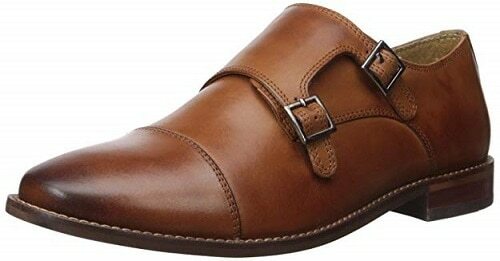 Of all the types of monk shoes, these are the most formal. Ideal for casual weddings and other semi-formal get-togethers, a classic monk shoe is always a safe and stylish option. By implementing an additional piece of leather that is stitched over the toe of the shoe, toe cap monk strap shoes are slightly edgier than their classic competitors. The stitched cap is still subtle but does add an additional style element to the overall appeal. These are ideal for office places and are popular choices for office staff, lawyers and businessmen. Otherwise known as brogues, this shoe design has a toe cap that extends out along the body of the shoe, tapering into a wing shape. Often including perforations, these add an element of jazz to the overall style. However, this sharp addition of intricacy also takes the shoe a step away from formality, making them slightly more casual, yet ideal for cocktail bars, date nights and casual nights out in town. Even more casual variations of the monk strap shoe might include a thick rubber sole, light shades, bold colors or experimental patterns. These are less likely shoes you would wear with a blazer or in a casual business scenario and more a lighthearted shoe you might use to spice up a pair of jeans and an Oxford shirt. In short, they’re less dressy and more fun. With both suede and leather alternatives, they add a little bit of funk and playfulness to the traditional monk style but exist in a shoe category all their own. Slightly similar to best selling chelsea boots, monk strap boots have all the power of a boot contained in the peaceful sole of a monk sandal. They usually have the same design elements of a monk strap shoe, but with an extended top. The increased body commonly allows for the addition of more buckles, which definitely adds a unique element of style. A little more advanced than popular chukka boots, the monk strap boot is a wonderful, mid-top hybrid alternative for those looking to add to their fall and winter shoe collection. Classic law on monk strap shoe fashion dictates leather is the best material. It’s robust, classic and easy to care for. Some wilder, adventurous brands have tried crafting shoes out of synthetic materials or strange animal skins like an alligator. Unless you are after an entirely different style of monk strap and you’re considering a suede shoe, always go with genuine leather and skip the synthetic stuff. When it comes to leather, you’ll need to choose if you want it to be matte or high-shine. Though high-shine shoes may catch your eye on the rack, when they’re on your feet they look tacky and cheap. For that reason, with little exception, always opt for the matte leather materials, for a refined and upscale look and feel. Monk strap shoe colors have a little less of an acceptable variation than other shoes like boat shoes or even Oxford shoes. They commonly range from dark brown to reddish burgundy or any other dark, earthy color. Although blacks, tans and other colors do exist, they’re certainly less versatile and often times a little less fashionable. If you own a lot of gray and charcoal suits, it’s okay to spring for a pair of black monk shoes, though the browns and tans are definitely the more classic choice. A shoe is only as good as the sum of its parts. Regardless of the material you’ve chosen and whether you’ve gone with a single, double or multi-strap design, you’ll want to select a shoe with a solid sole, fashionable upper and buckles and attractive straps. A quality sole on a shoe can make all the difference. 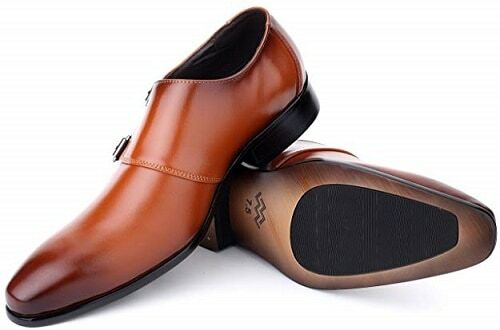 While some cheaper brands will outsource the manufacturing of their soles, high-quality monk shoes will have a sole that is designed and produced by the same company and implemented directly to the design, not manufactured elsewhere and shoddily attached like an afterthought. The type of sole you’re looking for will depend on the climate. While many monk strap shoes have a traditional leather bottom, climates prone to ice and rain may call for rubber inset soles for improved traction. The upper, unshockingly, refers to the top part of the shoe. It includes the material covering the toes, top of the foot, sides and also the heel. When it comes to the upper, overall design and material are the most important elements. Design (whether wing tipped, toe-capped or classic) will depend on your personal taste. The material should ideally be leather or suede, as synthetic alternatives age poorly and fall apart. Buckles are (quite literally) what holds the whole shoe together. In this category, the material is key. Commonly made out of brass, chrome or stainless steel, a quality buckle can be the difference between a pair of monk shoes that last a lifetime and one that falls apart with wear. A good buckle shouldn’t just look good, it should feel good too, containing a tactile pleasure. It should be heavy, solid and durable. To put it simply, the buckle of your shoes should feel expensive and durable, like it could hold more weight than it would ever reasonably need to. While they are often rectangular and made of brass or chrome, the buckles can come in just about any size, metal and shape. Which you select is going to determine a lot about the overall presentation and style of the shoe, so choose carefully. Also consider what color your cufflinks, tie bar, belt buckle and collar pin are. You might not always be able to match metal tones and colors, but it’s ideal if you can. The main element when considering strap style is spacing. Classic style dictates that monk straps should be at least two inches apart, and ideally set at an angle rather than placed perfectly parallel to one another. Though you probably will love your new monk strap shoes, you probably don’t want to sleep in them or wear them for the rest of your life. For this reason, straps often include a bit of elastic preceding the buckle, to ease the difficulty of getting the shoe on and off. If you need wonderful looking shoes that’ll also make you stand out among other men, Bruno Marc is the best deal. You’re less likely to experience discomfort while wearing them because they’re designed with a premium leather lining and latex cushioned footbed to enhance foot comfort. Also made to give you a classier look and enhance flexibility at the same time, they have a brogue wingtip design that most men really appreciate. They’re also fitted with a wooden heel which not only makes them eco-friendly but also helps keep your heels, toes and ankles even more comfortable. 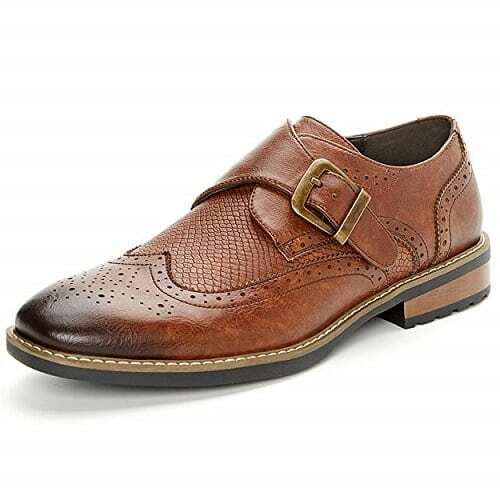 This show is available in different colors and sizes and you can choose between the monk strap and the lace-up design. Manufactured with a premium, synthetic leather dress and sole, GM Golaiman Shoes will make you look great at an affordable price. They’re made of a nice and smooth leather lining that’s carefully fitted with a cushioned footbed to help with shock absorption. They also have a ribbed, long-lasting dress sole that provides more comfort and traction. The heels are about 1.18 inches, therefore you can comfortably wear them while working or just as a normal casual variation. If you love looking classy, this shoe has a fantastic design that’ll make you stand out wherever you show up. It has a 5-eyelet lace-up vamp and cap toe design that most people find very attractive at first glance. If you need a classy looking, leather shoe that can last you for a very long time, Stacy Adams Dinsmore is the best you can ask for. The classy design is impressive and includes an amazing, plain toe medallion and monk buckle oxford with great burnished brogue perforated trims. For the comfort and great flexibility, they’re fitted with a cushioned insole that’s reinforced with memory foam for extra comfort. Created with breathable linings and lightweight construction to enhance durability, this product has a synthetic outsole that has stitch detailing at the low stacked heel. Designed to fit perfectly and provide you with great comfort, La Milano Double Monk Strap Shoes have everything you can ever ask for in any shoe. They’re available in a few different colors that you can match with your clothes. Constructed to fit perfectly and make you feel comfortable while standing, walking or dancing, they’re also very long lasting. This is because they’re carefully designed with high-quality leather material and have a great quality outsole with amazing stitch detailing. Made with a fantastic, leather lining and artfully looking design, Mio Marino Shoe is indeed a great combination of style and comfort. It has a great, tapered toe design and a cushioned insole for extra flexibility and comfort. Perfectly fitted with a long-lasting rubber outsole and grip pads, it doesn’t slip easily from your feet. It’s also crafted with genuine leather, hence it’s much more durable. Additionally, it’s available in different colors and various fitting sizes you can choose from. As an added bonus, it comes in a water-resistant shoe bag that looks classy and stylish. Coming with a soft cushion technology, CLARKS Tilden Style Monk Strap Shoes are extremely comfortable and you can purchase them at an incredible price. They’re also made to fit perfectly and are available in multiple, great looking colors. Fitted with removable and comfortable footbed to allow you more access when cleaning, their interior is also lined with fabric that helps your feet to feel more comfortable. Other than the classy look, they’re designed to last long, which makes them more economical. Made of high-quality leather, they’re fitted with flexible thermoplastic rubber outsole for extra durability. The heel is about 0.98inches, hence you can comfortably wear them to the office or for your daily routines. Designed to fit perfectly, look classier and feel comfortable, La Milano Double Monk Strap Slip-on Shoes are made of high-quality leather, equipped with a synthetic lining, stacked heel and extremely comfortable insole. They have a non-skid sole that’s soft and quiet when walking. Furthermore, the double buckle is an awesome feature that makes them stand out. Since it has a special, tapered cap toe design and is also created with fine Argentinean leather, this shoe is ideal for any party event or formal commitment. It’s available in different good looking colors and you can also easily find the one that fits you perfectly since it’s designed in almost all sizes. In case you need an amazing shoe for work or daily routine, Stacy Adams Macmillian should be the way to go. The fact that’s designed with genuine leather makes it a high-quality shoe. The first thing you’ll notice about it is the classy look that involves a great stitch detail on the heel encounter and cap-toe. 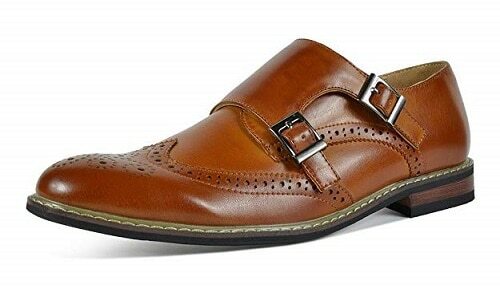 This stylish design also includes a fantastic monk-strap slip-on fitted with an elastic strap to allow easy feet entry. This product is also very comfortable, which is mostly because it’s fully fitted with memory foam insole that’s ideal for shock absorption. If you fit in between two sizes, it’s advisable to go for the larger size to improve comfort. Lightweight construction and breathable linings make them last longer than any other regular shoes in the market. The outsole is very flexible with enhanced traction on the heel and midfoot. Florsheim Monk Straps will get you multiple compliments wherever you go and provide you with a great quality performance you can rely on thanks to their classy style. You can comfortably wear them to any event because they feel pretty comfortable and will not hurt your ankles and Achilles tendon. The insole is completely cushioned with a memory foam based technology to enhance comfort. Extremely high in quality and with the upper dressing made of genuine leather, they’re also fitted with a breathable lining and great performing moisture wicking Suedetec. Another outstanding feature of this shoe is the long lasting sole that is made of flexible rubber. Frequent travelers will find stylish looking UV SIGNATURE Monk Strap Boots extremely useful and comfortable. They’re multifunction which means you can easily wear them with any dress or straight leg pants. You can also wear them to any party or formal event. The use of man-made, faux leather on the upper gives them a classy look. They also have a block heel and cap toe details that compliment their elegant design. Made to fit perfectly and more comfortable for easy movement, these shoes are excellent even for men with wide feet because you can put them on without adjusting the straps too much. When we talk about footwear, we like to prioritize comfort, protection, design and durability. La Milano Double Monk Strap Shoes are known for this and also for their versatility, size accuracy and ease to put on. Its upper is made from authentic Argentinean leather and linings from a synthetic material. The insole is adequate and very comfortable. The stacked heel helps in weight distribution during heel strike. To say that this pair is versatile is an understatement since it’s an ideal pick for nearly every occasion. The truth is that it’ll faultlessly blend with all types of shorts or a pair of trousers. It’s therefore ideal for dress, casual, party and formal occasions. The trending cap and toe design feature a unique paint and brush technology that you won’t find anywhere else. With a heel of about 1.25 inches, Johnston & Murphy Double Monk Strap Shoes feel incredibly comfortable to wear. They have a light cushioned footbed to provide your feet with extra comfort. The outsole is made of rubber and stacked heel for extra comfort. Made to last long due to its high-quality pure leather material, this shoe has a sophisticated design that makes it one of the most stylish men shoe in the market. Its design features two-buckle accents and broguing. You can easily find an appropriate size for you because this product is made in various sizes and it’s also available in mahogany and black calfskin color. Created with a full leather lining, Cole Haan not only look elegant but they’re also super comfortable. They may feel tight at first but will fit perfectly after the first day of wearing them. They also have a correct shaft measurement that offers flexibility in movement. Unlike its competitors in the market, this shoe has a full leather sole, a rubber forepart, wheeled welt and heel tap. The upper dressing is also fully lined with leather. They come in two colors, british tan and black. Furthermore, they’re designed in various fitting sizes so you can find your normal size. Nearly every men who tried Calvin Klein Monk Straps claims they’re extremely comfortable to wear and fit perfectly. They’re made of fine leather which helps them last. Because they’re nicely constructed, you’re most likely to get compliments from your friends and colleagues that they look very stylish with their distinct slip-on with buckles. Ideal for everyday use, these shoes have a textured leather toe, a smooth vamp and heel to provide you with an all-day-long comfort. You can rely on them to last you for a very long time due to their high-quality material. Its design is composed of genuine leather, a firm, cushioned insole and an excellent, man-made outsole. Designed with fine, genuine leather in the upper dressing and rubber sole, Unlisted by Kenneth Cole Monk Straps are a perfect combination of comfort and great look. They’re fitted with a soft inner lining and flexible, soft synthetic outsole to provide you with ultimate, all day long support and comfort. The leather upper looks very elegant and will undoubtedly earn you compliments wherever you show up. You can easily get a size that matches your foot perfectly since they’re available in various sizes for men. Other than the classy look and comfort, this shoe is carefully created to resist damage and last you for a very long time. 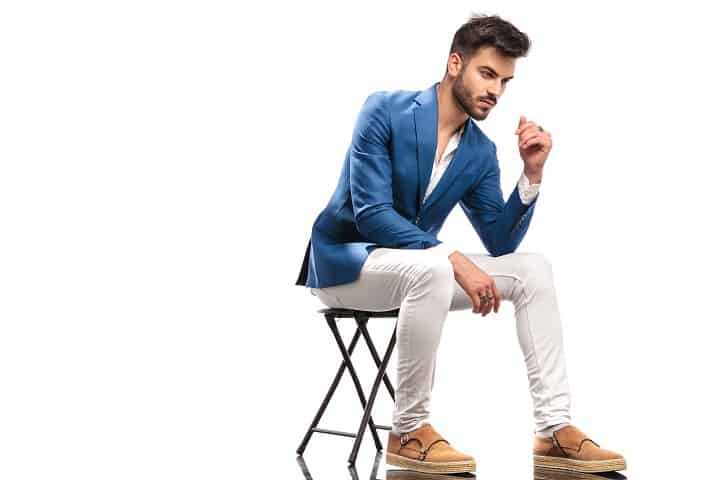 Because of their trendy, casual style, in Mediterranean countries, it’s common for fashion-savvy men to sport their monk shoes with the buckle either partially or completely unhinged, assumedly to give the look of breezy nonchalance. However, it could also just lead to a day full of well-meaning strangers trying to notify you that your shoe’s undone. Monk strap shoes do have their limitations. Because of their casual nature, they’re not suited for formal wear or black tie events. Avoid wearing them to funerals, high-fashion weddings and any black or white tie event. Never wear them with three-piece suits or tuxedos, either. Otherwise, the monk strap shoe is generously versatile in its uses. As a slightly less formal shoe than the Oxford or the derby, it pairs well with business clothing, casual outfits, business casual, blazers, sports coats, tweed and combinations. They have a lot more personality than a standard, lace-up Oxford shoe or it’s equivalent. Between formal and casual, monk shoes fall somewhere in the middle. One of the most versatile dress shoes can be dressed down as casual, worn to the office as business casual, worn with blazers, navy, suits of almost any color and tweeds. When it comes to which pants to wear with monk shoes, you have a world of options. In the infamous debate between chino vs khaki, the good news is that the monk strap shoe is versatile enough to be paired with either. In fact, they can even be paired with denim and worn with men’s jeans for a casual-yet-dapper look. Ideally, when crafting the perfect ensemble that’s accented with monk strap shoes, you’ll want the buckle to match the metal of the rest of your setup. Belts for men should match the buckle metal of your shoes. If you’re into the retro look, instead of a belt you can go with one of the items from the list of best suspenders, but you’ll still want to aim to match the metal of the suspender to your buckles. 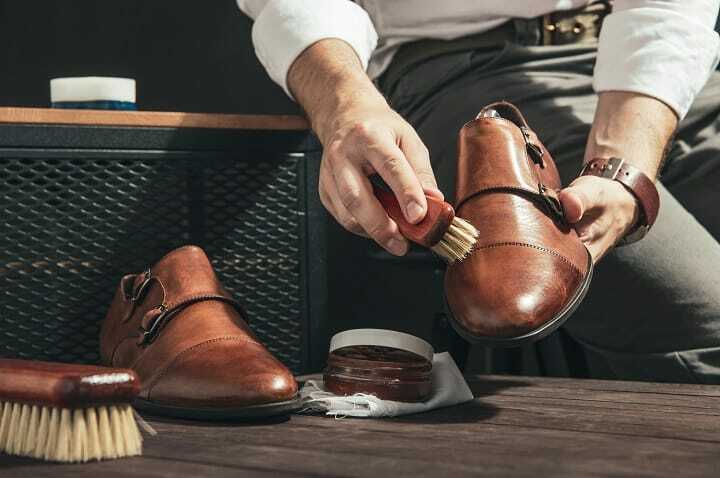 If you’ve purchased a standard leather monk shoe, you should clean it using the same method you’d use to clean any other leather shoe. First, brush away dirt using a soft brush designed specifically for leather shoes. After that, remove the laces so you can reach all areas of the shoe. Wipe the shoe with a damp cloth that’s been dabbed in a gentle detergent, aiming to remove any remaining dirt or mud. Using a clean cloth with fresh water, remove the soap and clean the surface. Let the shoes air dry before wearing them. After cleaning, if you’d like to give your shoe added protection, you can use a leather protector spray to seal in moisture and slow aging. Products like these can also be used on all types of wallets made of leather as well as leather belts. Because monk straps are cut higher on foot and have no real opening like lace-up shoes, you’ll want to use a shoe horn to put them on. Though the strapped design of these shoes is fashionable, they also make it harder to insert on your foot. Often, struggling to put the shoes on can damage or crush the heel or permanently bend or compromise the shoe design. For these reasons, invest in a shoe horn. Plus, you’ll feel a little fancy when you use it. Just unbuckle the straps, get in with the shoe horn and close it. Especially with multi-strap designs, it can be time-consuming to undo all straps and use the horn, but it’s worth it to preserve a good pair for long-term use. Can you wear socks with monk strap shoes? Monk shoes are the perfect footwear to let your sock style shine. Their low-cut design makes men’s socks visible. If you’re feeling daring and the shoe design itself isn’t enough of a statement for you, you can mix up a look with a bold pattern or color. The only exception, of course, is the monk strap boot. These can (and should) be worn with a higher sock, to provide comfortability and prevent chafing. 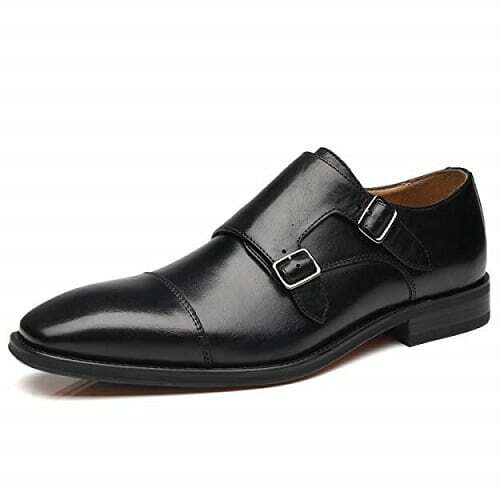 Are monk strap shoes non-slip? The short answer here is that it depends. 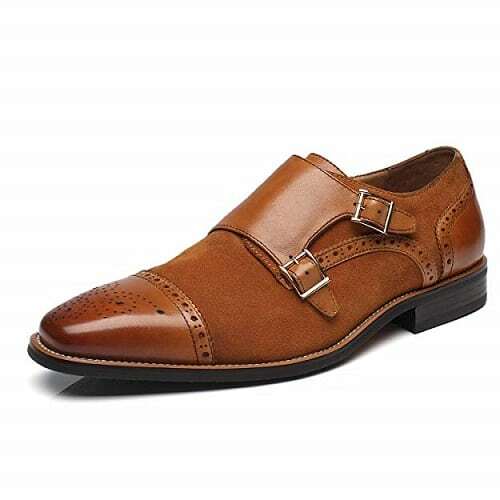 While traditionally, monk strap shoes have a standard leather bottom which isn’t exactly conducive to grip, there are variations on the monk shoe which have rubber soles instead. These provide slightly more grip and push the shoe towards being a bit more non-slip. Are monk strap shoes waterproof? Monk strap shoes aren’t (and shouldn’t need to be) waterproof. At least, none of the traditional ones on the market are, anyway. As a trendy shoe, monk shoes aren’t exactly made with the same activities or conditions in mind as their more casual, nautical brother, the boat shoe. 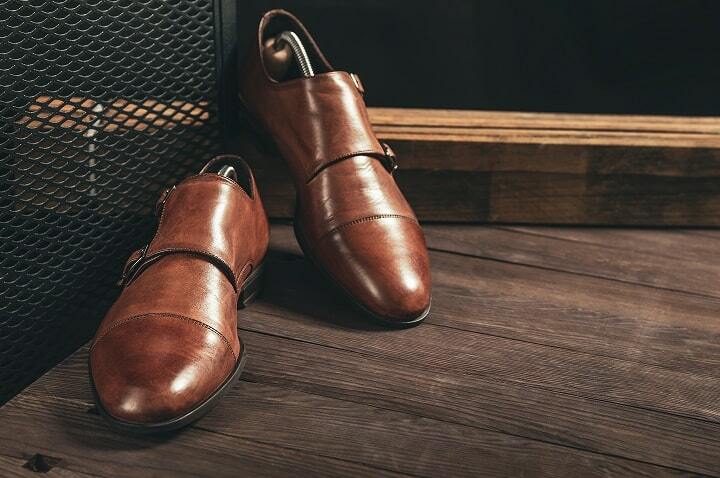 However, leather monk shoes can be treated with a water-resistant spray to minimize moisture damage for those living in climates with snow or rain. Whether you’re a bit of a fashion conservative looking for some Sunday-morning shoes or a businessman with a rebellious streak, expressing your style through your footwear is an excellent way to display your personality. From single strap to double strap, monk shoes come in a variety of designs and styles that can be rocked at the office, in the bar or on a date. If you’re devoted to high fashion and faithful about footwear that makes a statement, these might be the shoes you’ve been praying for. Photos from: [email protected] / depositphotos.com, feedough / depositphotos.com, the_lightwriter / depositphotos.com, baloon111 / depositphotos.com and robertprzybysz / depositphotos.com.